This stone cottage on 1.8 hectares (4 acres) of farmland has been meticulously restored to the highest standards of taste and comfort with antique finishings and modern conveniences and is available for rental in all four seasons. Taking maximum advantage of a relatively compact space, the ground floor offers a living/dining area overlooking a stone patio (the actual dining area for most of the year), a fully equipped ultra-convenient gourmet kitchen, a functioning wood stove, and a half-bathroom under a custom-made plaster spiral staircase. The house has satellite television, high-speed WiFi, and internet telephony with free calling anywhere. The spiral staircase leads up to a master bedroom with views in all directions and an artisan-created fully modern bathroom with shower and double sink fitted out with antique doors and tiles. The house is cool in summer and warm in winter, with both electric heat and a functional wood stove. It contains two iPod stereo players. The large property includes a magnificent round stone irrigation bassin (10 meters in diameter), which has been transformed into a swimming pool while retaining its original form. The pool sits in a well defined area 30 meters (100 feet) square, planted with grass and willows, with a full view of the village, including sunsets behind the chateau. The bassin was originally fed by a spring (on old maps the location is called ''Le Gourt,'' a Celtic word for spring-fed basin) which now flows into six wells on the property. 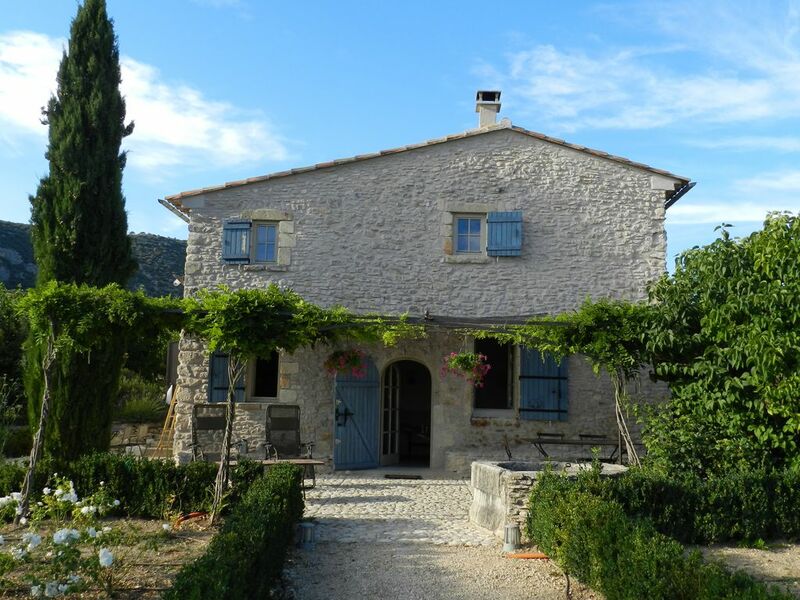 The house has open views in all directions, south to the Luberon mountains, north to the plateau of the Vaucluse, and west to the hilltop village of St. Saturnin-les-Apt with its ruined chateau, church, and windmill. The house is surrounded on three sides by a terrasse (patio) incorporating two old stone wells and paved on the south and west by a ''calade'' constructed entirely of stones from an old threshing floor unearthed during renovation. The south side is shaded by a wisteria-planted custom-made iron tonnelle (canopy) overlooking the Luberon mountains in the distance. The immediate view is of a gently sloping gravel pathway bordered by lavender, boxwood, roses, and olive trees, leading down to the pool area. The property is on a working farm (cherries and olives). The property is on the outskirts of a village with all amenities. 'Ferrage' refers to farmland just outside a village. View of the montagne du Luberon. Lovely small house in a glorious setting. We had a marvellous week here and missed the prophesized bad weather completely. The wistaria covered terrace was perfect in the sun. The village is only a 10 minute walk away, down tracks and back lanes, and when you get there has everything you would hope for. Definitely not one of the honeypots groaning with day-trippers but a full set of thriving bars, restaurants, bakers, even a weekly market. Marie-Aude and her helpers were very friendly and had kept the garden beautifully. Altogether a lovely place to stay - definitely one we would consider again. Thank you Trevor! We re very glad that events conspired to assure you a perfect stay. Your comment does a wonderful job of capturing the reasons we think this place is special. Hope to see you back! We had a wonderful stay at La Ferrage. The house itself is so tastefully decorated with every room at a high standard and very roomy. The bathroom is big and wonderfully appointed with dual sinks. The bedroom is roomy and very comfortable. The lounge is just right, tastefully decorated and comfortable and the kitchen has all you need (even sharp knives... a first in a rental property for us!). However, it's the outdoor spaces that make this property such a superb holiday rental. Wandering down through the lavendar avenue to the large circular pool (much bigger than we were expecting) for a morning swim was wonderful. Spending the evening beneath the clematis canopy on the patio was so relaxing and the view across to the Luberon hills as they change colour in the evening light is beautiful. The cottage is located a short walk from the town, which has all you need. We had a lovely lunch at St Hubert's Hotel and there are a few other options close by. The town has two boulangeries and a Spar for essentials. Apt is only 10 minutes in the car for Supermarkets and from that road you can get to all the lovely villages of the region for sight seeing and long, lazy lunches. It really is the perfect place for two people wanting to soak themselves in the Luberon lifestyle. Thank you very much for having Sarah and me to stay at your perfect house. We have never found a house better equipped, laid out, organized, and directed than yours in very many years of coming to France. Very, very belatedly, I'm afraid....to tell you how enormously we enjoyed our time at La Ferrage. It was just pefect...(and the weather was very kind). We visited the local markets and villages....and chateaux....and on our last morning walked all over Buoux almost completely by ourselves which was just sensational. Marie Aude was wonderfully helpful. And we would love to think that we might be able to return, maybe next Autumn, for another dose of provencal magic. My trip was more relaxing and amazing than I had even hoped for. What an amazing spot, total confirmation that Provence is my happy place! I was able to run and ride my bike every day ( really I'm not an athlete but I wanted to justify all the cheese eating). I walked to town a few times every day (stood in line for my baguettes etc.) and even managed to run to the Chateau on my last morning to see the sunrise. I also did a fair share of napping in the hammocks and laying in and out of the pool. The kitchen had everything you need and more to prep & enjoy the spoils of the markets in the area. And the amazing sound system in the house allowed me to set a sound track to the whole vacation. Catherine, we're so pleased that you enjoyed your stay at LaFerrage. The cheese, baguettes, and other treats available right in St. Saturnin and in the neighboring weekly markets do provide irresistible temptations that can be happily enjoyed because there are so many delightful ways to exercise -- walking, biking, swimming...and then to rest from all that activity with a nap under the trees in the poolside hammock. You made good use of all that the cottage, and the region, has to offer! This cottage has every amenity you could wish for and more. We know the area quite well and love visiting so to get accommodation as good as this was the icing on the cake! The trouble is that it's now spoilt us for anywhere else. Marie-Aude was very welcoming and explained everything we needed to know. And yes we are coming back....! San Saturnin Les Apt is great place to stay as it's handy for large cities like Avignon and Marseille or all the beautiful little villages dotted around the area. If you like markets you will be in your element as you can find one nearby every day of the week. We are happy that you enjoyed LaFerrage and used it as a delightful home base to explore the Luberon and the towns and cities beyond. Now that LaFerrage has spoilt you for anywhere else in the region, we're so pleased to hear that you will be returning and we look forward to welcoming you back! It's the Luberon! One of the greatest all-around vacation-holiday places in the world! High season: last Saturday of May to first Saturday of September: $1,950/week Fall shoulder: first Saturday of September to first Saturday of October: $1400/week Low season fall: first Saturday of October to first Saturday of November: $960/week Off season fall: first Saturday of November to Saturday before Christmas: $650/week Holidays: Saturday before Christmas to first Saturday after New Year: $960/week Off season winter: first Saturday after New Year to first Saturday after March 21: $650/week Low season spring: first Saturday after March 21 to first Saturday April: $960/week Spring shoulder: fist Saturday April to last Saturday May: $1,400/week Includes cleaning once a week. ; Minimum stay one week,starting Saturday. ; no exceptions. VISA, MASTERCARD Dates Available: Year Round.